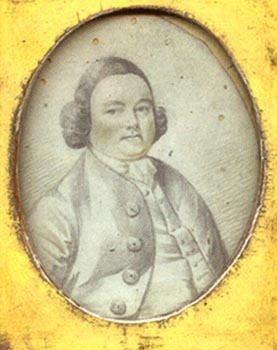 [ABOVE] A portrait miniature, drawn in pencil, of Joseph Molineux (1713-1771), who served as the High Constable of Lewes, Sussex, in 1745 and 1764. Born in Wolverhampton in 1713, the fourth son of John and Mary Molineux, Joseph Molineux settled in Lewes in 1738. Joseph Molineux became engaged in the iron trade and rose to become a prominent figure in Lewes, being appointed as High Constable and Receiver-General of Stamps and Taxes. 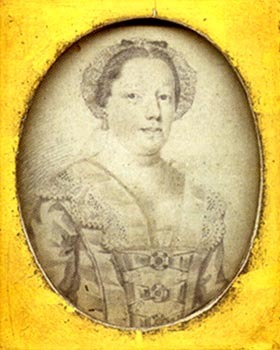 [ABOVE] A portrait miniature, drawn in pencil, of Mrs Ann Molineux (1715-1782), the wife of Joseph Molineux , the High Constable of Lewes [see portrait on left]. Ann was born in 1715, the daughter of Ann Apsley and Dr William Brett of Lewes. After her marriage to Joseph Molineux, Ann gave birth to at least six children, including three daughters - Cordelia, Ann and Elizabeth, and three sons- Joseph, John and Richard Molineux. 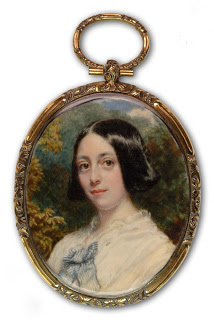 [ABOVE] A miniature portrait of Rosetta Louisa Prendergast painted in 1842 at the time of her engagement to William Frederick Fuller (1821-1910). The daughter of Mrs Rosetta Alicia Prendergast of Listerton, Co. Kilkenny, Miss Rosetta Prendergast came to live in Worthing with her mother after her father's death. Rosetta became engaged to William Fuller of Worthing, but she sadly died on 11th May 1843, at the age of 19. [ABOVE] A miniature portrait of William Frederick Fuller of Worthing painted in 1842. William Frederick Fuller (1821-1910) was born in Worthing on 11th May 1821 and when this portrait was painted in 1842, he was engaged to marry Miss Rosetta Prendergast [see portrait on left]. William F. Fuller eventually became a Branch Bank Manager for the Worthing banking firm of Henty, Upperton and Olliver. William Frederick Fuller died in February 1910 at the age of 88. [ABOVE] A miniaturist at work in the mid-18th century. Christian Friedrich Zincke (c1684-1767), the German-born miniature painter shown working on a tiny portrait in a drawing by the portrait artist William Hoare (1707-1792). The miniaturist Christian Friedrich Zincke was born in Dresden but came to live in London in 1706. Zincke became well-known for his enamel miniatures - portraits painted in vitreous enamel on a copper base. 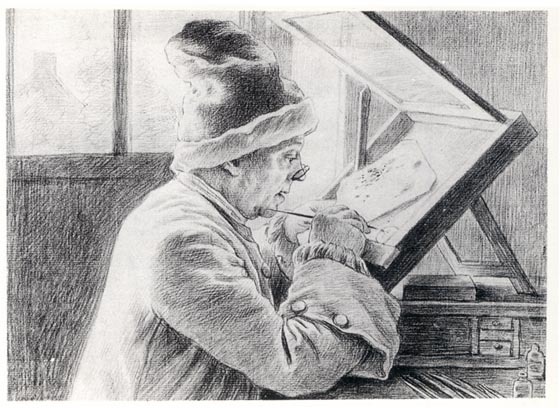 In William Hoare's drawing, Zincke is depicted using a fine nib, possibly to produce a stipple shading effect, a technique for which Zincke was famous. ADOLPHE, Edgar c1808-1890 4 East Street, BRIGHTON (1845) JENNINGS, Miss Mary fl.1885-1889 Brighton. ATKINSON, George fl.1820-1838 9 King's Road, BRIGHTON 40 Old Steine (1821-1822); BRIGHTON Brighton (1822-28) LANE, Miss Sarah fl.1854 158 North Street, Brighton. MARSH, Miss Eva E. 1882-1960. fl. 1905 Astolat, Salisbury Road, Worthing. MEYERHEIM, Robert G. 1847-1920 fl.1875-1914 Wimblehurst Road Horsham. MORTIMER, John Hamilton 1741-1779 Exhib.1762-1779 Born in Eastbourne, 1741. BRUETON, Frederick 1859-1916; fl 1896-1911 21 Clermont Terrace, Preston, BRIGHTON ORCHARD, Miss Gertrude fl.1897-1905 London and Eastbourne. BUCKNER, Richard 1812-1883; fl 1842-1877 Wyke House, CHICHESTER PALMER, Miss Maude c. fl.1903-1914 Bexhill-on-Sea. CLINK, Miss Edith Lydia 1868-1943; fl 1895-1913 8 Western Road, LITTLEHAMPTON, Sx. PEGRAM, Frederick born 1870. Exhib.1889-1904 The Grove, Singleton, Chichester. PETHER, Abraham FSA 1756-1812 exhib.1773-1811 Born in Chichester. PIGGOTT, Miss Mary H. C.
1879-1941 fl.1907-09 Hartsholme, Seaford, Sussex. SELOUS, Miss Dorothea M born c1881 fl.1908-1909 Of London and Hove, Sussex. Exhibited at the RA 1908-1909. Studio at 69 East Street, Brighton (1869-1872). Residence:11 Rose Hill Terrace, Brighton (1871). STROUD, Miss Helen Maud (Mrs Wm WHEELWRIGHT) 1868-1961 fl.1895-1912. Cleves, Ditchling, Sussex (1911-1915). born 1872 London fl.1895-1896 Norton Villa, Rottingdean, Sussex. 1808-1892 fl.1831-1881 Born 20th April 1808, Worthing, son of John Tidey who ran a private school in Worthing. 1813-1872 fl.1839-1872 Born in Worthing, 7 January 1813, brother of Alfred Tidey. fl.1909-1910 Seaford, Sussex and London. HARDY, James 1801-1879; fl 1825-1879 143 North Street, BRIGHTON (1831-1832) 163 Royal Colonnade, BRIGHTON (1832-34); LEWES (1836); West Street, CHICHESTER (1837-1845). fl.1761-1762 Apparently worked in Sussex, possibly Chichester. (died 1844?) fl.1836-1839 London and Chichester, Sussex. HORRELL, Mrs Nora Aimee 1877-1957; fl 1910-1914 2 Albion Terrace, Brighton Road WORTHING WILSON, Miss Beatrice J. fl.1897-1914 .St. Leonards-on-Sea, Sussex. [ABOVE] A portrait miniature of Charles Hanbury, 1st Baron Sudeley, painted on ivory in 1842 by Charles J. Basebe (1818-1880). This portrait miniature measures approximately 4.5 inches by 3.5 inches (11.5cm x 9cm). Charles Jones Basebe was born in Sussex in 1818. Charles Basebe had shown artistic talent at an early age and by the time he was 17, he was exhibiting his work in London. Charles J. Basebe became a professional artist and earned his living as a portrait painter in London and Brighton. 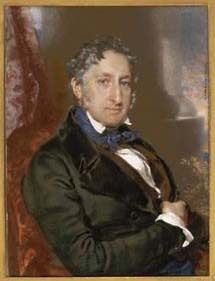 From 1835 to 1879, Charles J. Basebe exhibited portraits and miniatures at the Society of British Artists and the Royal Academy. Charles J. Basebe painted portraits of the upper ranks of society and his sitters comprised of clergymen, wealthy gentlemen and members of the nobility, including Prince Albert, Queen Victoria's consort. However, Charles J. Basebe achieved more public notice as a painter of cricketers. In the 1840s, Charles J. Basebe produced a number of full-length portraits of famous bowlers and batsmen, which were later issued as coloured prints. Between 1843 and 1849, Charles Basebe collaborated with William Drummond (born c1811), another portrait painter with links to Sussex, to produce a picture entitled 'A Cricket Match between the Counties of Sussex and Kent, at Brighton'. This panoramic view of an imaginary match at the cricket ground near Brighton's St. Peter's Church, features around seventy individual portraits of famous cricketers and well known "Patrons of the Noble Game of Cricket". All the portraits were "taken from life by Mr W. Drummond and Mr C. J. Basebe" over a period of years and the picture of "The Cricket Match" was eventually published in 1849 as a hand-coloured print (together with a key to the portraits) by William Henry Goodburn Mason (1810-1879), a print-seller of King's Road Brighton. 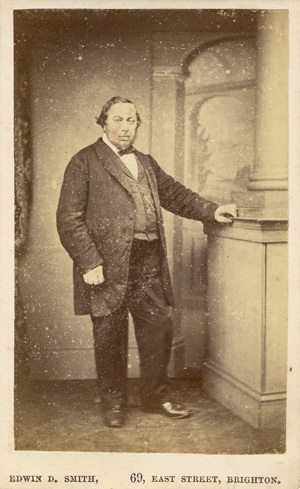 (A few years later, William Henry Goodburn Mason was to play an important role in the early history of photography by allowing Hennah & Kent to establish their Talbotype Portrait Gallery at his Repository of Arts at 108 King's Road, Brighton). After his marriage around 1842, Charles Jones Basebe settled in North London, but he made frequent visits to Brighton, often staying with William Henry Goodburn Mason at 108 King's Road, Brighton. Charles Jones Basebe and his wife Caroline (born c1821, Bayswater, London), produced at least 9 children, a number of whom became artists and photographers. Their eldest son Charles J. Edward Basebe (born 1845, St Pancras, London) worked as a portrait painter in London and Bristol. Athelstane Basebe (born 1853, Camden Town) became a portrait painter and a photographer, operating photographic studios in London, East Grinstead, Hemel Hempstead and Watford. Athelstane's younger brother Harold Ernest Basebe (born 1856, St Pancras, London) was primarily a watercolour artist, but he briefly worked as a photographer in Worthing in the early 1890s. Edgar Allan Basebe (born 1860, St Pancras, London) became a photographer in Cambridgeshire and from 1901 to 1910 was a partner in the firm of Mason & Basebe, a photographic portrait studio in Market Street, Cambridge. Ethelred Basebe (aka Bertram Basebe), who was born in Camden Town early in 1868, was the youngest son of Charles and Caroline Basebe and worked as a photographer in East Grinstead and Worthing before moving to Watford where he was employed as a photographic artist in the early 1900s. Charles J. Basebe died in Islington, North London, on 22nd January,1880, leaving property worth less than �300 to his widow Mrs Caroline Basebe. For the remainder of her life, Mrs Caroline Basebe was supported by her children and over the next 25 years she shared her life with her sons, who took turns caring for her. Mrs Caroline Basebe died in 1905 at the age of 84 at Cambridge, where Edgar Basebe worked as a photographic artist. [ABOVE] A portrait miniature of George Hay Dawkins Pennant painted on ivory in 1864 by Charles J. Basebe (1818-1880).This portrait miniature measures approximately 4 inches by 3 inches (10.3cm x 7.5cm). 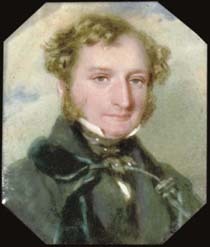 [ABOVE] A portrait miniature of Mr F. Tracy, painted in 1840 by Charles J. Basebe (1818-1880). The portrait is inscribed "Painted by Chas. J. Basebe, 59 Pratt Street. October 31st '40, Camden Town London". The artist Charles Jones Basebe spent most of his married life living in North London (St Pancras, Camden Town, Islington). Richard Buckner was born on 25th October 1812 at Royal Arsenal, Woolwich, the son of Mary Marsh Peirce and Lieutenant-Colonel Richard Buckner of the Royal Artillery. The Buckners were a prominent Chichester family with a country residence at Wyke House, Rumboldswyke. As a young man, Richard Buckner worked from a studio attached to the family home in Rumboldswyke, West Sussex. 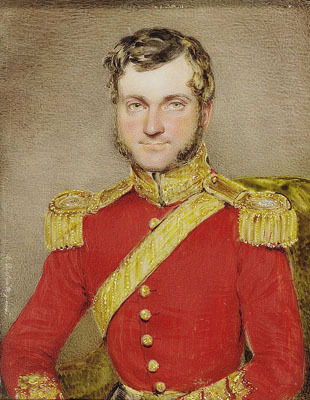 In 1832, at the age of 20, Richard Buckner junior became an officer in the 60th Regiment of the King's Royal Rifle Corps (60th Rifles), serving as a Second Lieutenant in Ireland and the Mediterranean between 1832 and 1834. After he left the Army, Richard Buckner returned to the family home, painting miniature portraits at the Wyke House studio. 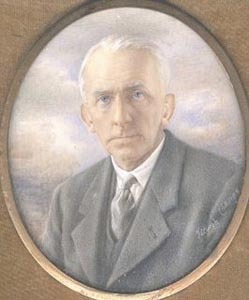 B. S. Long in his work "British Miniaturists" (1929) described Buckner's miniature portraits as "pretty and delicately painted". During the late 1830s and early 1840s, Richard Buckner studied in Rome under Giovanni Battista Canevari (1789-1876), a distinguished miniaturist and portrait painter. Richard Buckner eventually set up his own portrait studio in Rome at 95 Piazza Barberini. Richard Buckner shared his time between Italy and England. In 1846, the Royal Academy listed Richard Buckner's "place of abode" as 95 Piazza Barberini, Rome, and 90 Wardour Street, London. Between 1842 and 1877, Richard Buckner exhibited his work at London's Royal Academy. From the 1840s, Richard Buckner produced works on Italian subjects (e.g. Italian Peasant Boy, Shepherd of the Campagna di Roma) and painted large-scale portraits (e.g. Portrait of Mrs Digby and Child, Lady Charlotte Guest). 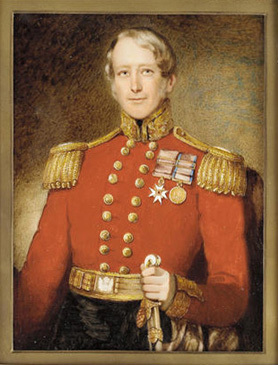 Richard Buckner's reputation as a portrait painter grew during the 1840s and he was soon receiving commissions from leading figures in British society, including Queen Victoria and Prince Albert. It is reported that by the early 1860s, Buckner was earning above �6,000 a year. Richard Buckner spent his declining years in London, lodging at 2 Cleveland Row, Westminster. On the 1881 census, Richard Buckner is described as a "Portrait Painter". Richard Buckner, who never married, died in London on 12th August 1883 at the age of 71. 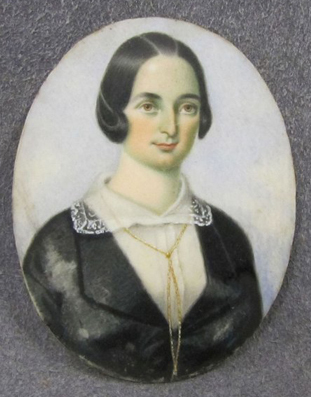 [ABOVE] A miniature portrait of Mrs Mary Elizabeth Lucy, painted around 1838 by Richard Buckner (1812-1883). Born Mary Elizabeth Williams at Bodlewyddan, North Wales, on 25th November 1803, Mary married George Lucy of Charlecote, Warwickshire, on 2nd December 1823. She lived at Charlecote House until her death in 1890 at the age of 86. Daniel Byrne was born in Dublin, Ireland, around 1814. Byrne was based in London* by 1840. After marrying his wife, Sarah Byrne (born c1828, London) around 1854, Daniel Byrne settled in Brighton. At the time of the 1861 census, Daniel Byrne was recorded as a "Miniature Painter", living with his 33 year old wife Sarah at 42 Middle Street, Brighton. Subsequent censuses in 1871, 1881, and 1891 place Daniel Byrne at a Sussex address. During the early 1870s, Daniel Byrne was working as a miniature painter at 8 West Hill Place, Brighton. Between 1878 and 1881, Daniel Byrne was listed as a "miniature painter" at 76 Ship Street, Brighton. His final years appear to have been spent at a house in Exeter Street (Nos. 8 & 11) located in the Preston district of Brighton. 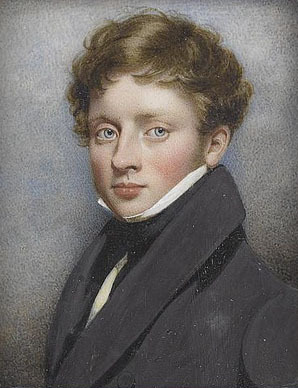 Daniel Byrne exhibited portraits and miniatures at the Royal Hibernian Academy in Dublin and the Royal Academy in London between 1836 and 1880. Byrne's portraits were often submitted to the Royal Academy from a Brighton address. The death of Daniel Byrne was registered in the Sussex district of Steyning (which included the Brighton suburb of Preston) during the 1st Quarter of 1896. It is recorded that Daniel Byrne was 82 years old at the time of his death. [ABOVE] A miniature portrait of a woman wearing a gold necklace, painted on a ceramic base by Daniel Byrne (c1880). This is a late example of Byrne's work. 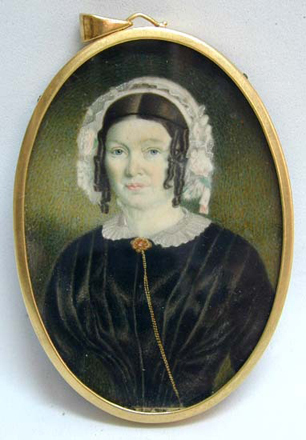 Daniel Byrne was creating miniature portraits as early as 1836. Arthur Albert Collings* was born towards the end of 1859 at Weston-super-Mare, Somerset [birth registered in the Axbridge district of Somerset during the Fourth Quarter of 1859]. Arthur Albert Collings was the youngest son of James Collings (born c1816, Weston-super-Mare), a successful bootmaker, and his wife Elizabeth Harvey (born c1818, Gloucestershire). In 1887, Arthur Albert Collings married Keturah Anne Beedle (born 1862, Weston-super-Mare), the daughter of William Henry Beedle (born c1831, Bristol), an upholsterer and house furnisher, and his wife Eliza Williams (born c1833, Wales). Both Arthur and his wife Keturah had artistic talent and it is possible that they were brought together through their interest in art. It is very probable that at the time of their marriage, Arthur and his wife were working as artists or photographers. In 1887, Arthur Collings entered into a business partnership with the photographer and future movie maker William Friese Greene (1855-1921). The short-lived partnership between the two photographers came to an end in May 1888 and later that year, under the professional name of "A. Esme Collings", Arthur Collings took control of the firm's former studios at 69 New Bond Street, London and 69 Western Road, Hove. After the break up of his partnership with William Friese Greene in 1888, Arthur Esme Collings moved down to Brighton, Sussex, to take personal charge of the studio at 69 Western Road, Hove. At the time of the 1891 census, Arthur and Keturah Collings were residing at 59 Dyke Road, Brighton. Arthur A. Collings is recorded in the census return as an "Artist Photographer" aged 31. No occupation is given for his twenty-nine year old wife, but presumably Keturah assisted her husband in his photographic studio in Western Road, Hove. At the end of 1892, Keturah gave birth to a son named Arthur Cyril Esme Collings [birth registered in Brighton during the Fourth Quarter of 1892]. Sometime before 1899, Arthur Collings and his family moved to 13 Alexandra Villas, Albert Road, in the West Hill area of Brighton. Arthur Esme Collings ran the studio at 69 Western Road, Hove from about 1888 to 1893. Around 1893, Arthur Esme Collings transferred his studio to 120 Western Road, Hove. The name of A. Esme Collings was attached to the photographic studio in Western Road, Hove, from about 1890 to 1915. On the 1901 census return, Collings gives his real name of Arthur Albert Collings and the enumerator describes him as a "Photographer ( Employer )" aged 41. The Hove based photographer is shown living at 13 Alexandra Villas, Albert Road, Brighton with his wife Keturah Ann Collings, aged 39, and their eight year old son Arthur Cyril Esme Collings. Arthur Esme Collings had previously worked as a photographer alongside the pioneer film maker William Friese Greene. After he moved down to the Sussex coast, Arthur Esme Collings began to make "moving films" of his own. Arthur Esme Collings produced over 30 short films in the Brighton and Hove area during 1896. By 1897, Arthur Esme Collings appears to have abandoned film making in order to concentrate on producing painted miniatures. Around this date, Collings published a small brochure entitled "The Revival of Miniature Art", which recounted "some romantic stories about miniatures and their painters." A little later, Collings issued a promotional catalogue with a similar title - "The Revival of Miniature Painting". The fifteen page booklet was designed to publicize the type of miniatures that could be produced at his Bond Street studio and included details of the prices for various styles of portrait miniature. By 1899, Esme Collings' London studio at 175 New Bond Street had become the headquarters of The Society of Miniature Painters. In Kelly's Directory of Sussex published in 1899, Arthur Esme Collings was the only person to be listed under the heading of 'Miniature Painters'. One example of Collings' work that has survived is a miniature of Adelina Patti, the famous soprano singer. The reproduction miniature has been glued onto one of his standard cabinet format card mounts which gives details of his photographic studio in West Brighton. 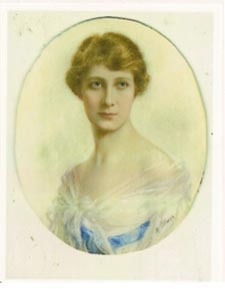 Most of Esme Collings' sitters were wealthy or famous. In 1899, Collings painted a miniature portrait of Frances Fleetwood Wilson (1850-1919), the English heiress who had recently married the Russian nobleman Prince Alexis Dolgorouki. "The very marked attention which the miniatures in the Royal Academy attracted this year is one of the many things which show how great a revival there has been in the taste for miniatures ... When photography appeared, it had no difficulty for a time in sweeping miniatures out of the field, for many people preferred the novelty of an exact portrait to a 'work of art'. But the pendulum of taste has again swung back. We no longer accept a coloured photograph as a substitute for a genuine miniature, but realise that the two things are quite distinct." H. M. Tindall, The Harmsworth Monthly Pictorial Magazine (1899). The miniatures of Arthur Esme Collings were also discussed in an article entitled "A Dream of Fair Women: The Work of Mr Esme Collings" which appeared in the magazine Lady's Realm in 1901. Miniatures by Arthur Esme Collings were also reproduced as photogravure illustrations in issues of The Sketch weekly magazine during 1899. Arthur Esme Collings worked as a portrait photographer and miniature painter at 120 Western Road, Hove until the Spring of 1906. On 24th May 1906, Arthur Esme Collings sold his studio in Hove, but the business continued under the name of Esme Collings (Hove) Ltd. until at least 1915. It appears that Arthur Esme Collings left Sussex and moved back to London around 1905. Mrs Keturah Collings, Arthur Esme Collings' wife, opened her own studio at 16 North Audley Street, London around this time. When the 1911 census was taken, Arthur Esme Collings and his wife Keturah Collings were residing at 25 Hillcroft Crescent, Ealing, Brentford, Middlesex. On the census return, Arthur Collings is described as a a "Photographer", aged 51. After he retired, Arthur Esme Collings returned to the Sussex coast. Arthur Albert Esme Collings died in the Sussex seaside resort of Eastbourne in 1936, at the age of 76. [ABOVE] A reproduction of an original miniature of the famous soprano Adelina Patti (1843-1919) by Arthur Esme Collings inscribed "Adelina Patti, Baroness Cederstrom, 1899" . [ABOVE] Arthur Esme Collings listed as the only miniature painter in the county of Sussex in Kelly's Directory of Sussex published in 1899. The street directory in the same edition records Arthur Esme Collings as a "Photographer and Miniature Painter" at 120 Western Road, Hove. 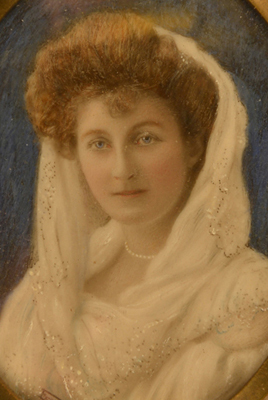 [ABOVE] A detail from a miniature portrait of Mrs Florence May Orr (formerly Barley), painted by the artist and photographer Arthur Esme Collings who operated a portrait studio at 120 Western Road, Hove, between 1893 and 1906. This portrait was probably painted around 1903, the year that Florence married James Spencer Orr (1882-1910). Don Shelton, an expert in miniature painting, believes that this miniature portrait was painted over a photographic base. Keturah Collings was the married name of Keturah Anne Beedle, who was born in 1862 at Weston-super-Mare, Somerset [birth registered in the Axbridge district of Somerset (Weston-super-Mare) during the First Quarter of 1862 ; baptised at Holy Trinity Church, Weston-super-Mare on 13th February 1862]. Keturah was the daughter of William Henry Beedle (born c1831 Bristol - died 1907), an upholsterer and house furnisher, and his wife Eliza Williams (born 1833 Cowbridge, Glamorgan, Wales - died 1903). Keturah's father was a successful businessman. In 1881, William Beedle was employing 9 men in his upholstery firm and was served by at least two servants at the family home, a large house called "The Elms" on Arundell Road in Weston Super Mare. (In the 1880s the road name was spelt 'Arundell' and not 'Arundel' as in the Sussex town of that name). In 1887, Keturah married Arthur Albert Collings, a photographic artist and former bootmaker of Weston Super Mare [marriage registered in the Axbridge district of Somerset (Weston-super-Mare) during the December Quarter of 1887]. [See panel above]. Both Keturah and Arthur had artistic talent and it is possible that they were brought together through their interest in art. The couple set up home in Brighton, Sussex. Arthur and Keturah's first home was at 59 Dyke Road, Brighton. In 1892, Keturah gave birth to their only son - Arthur Cyril Esme Collings [birth registered in Brighton during the Fourth Quarter of 1892]. By 1899, Keturah Collings was living with her husband and eight year old son at 13 Alexandra Villas, Albert Road, Brighton. Presumably, during the late 1880s and early 1890s, Keturah Collings assisted her husband (then working under the name of A. Esme Collings) in his photographic portrait studios in Brighton and Hove. From 1897, A. Esme Collings, began to promote the art of miniature painting and it appears that his wife started to produce portrait miniatures around the same time. By 1905, Mrs Keturah Collings had established her own fashionable portrait studio in West London. Keturah Collings was still producing portraits in the 1940s. Keturah Collings died in the London Borough of Ealing in 1948, at the age of 86. Joseph Sortain was born at Clifton, Bristol, on 20th July 1809. Sortain was educated at Bristol Baptist Academy and later studied at Cheshunt College and Trinity College, Dublin. From 1832 until his death in 1860, Reverend Sortain was the Minister at the Countess of Huntingdon's Chapel, North Street, Brighton. An admired preacher, Reverend Sortain's collected sermons were published in 1850. 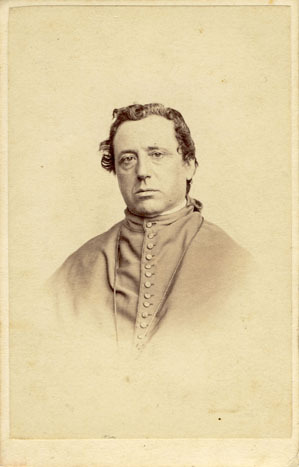 Joseph Sortain was also the author of two religious-themed novels - Hildebrand and the Excommunicated Emperor: A Tale (1851) and Count Arensberg: or, The Days of Martin Luther (1853). Joseph Sortain died on 16th July 1860, four days before his 51st birthday. The following year, Mrs Bridget Sortain, Reverend Sortain's widow, authored a memorial to her late husband entitled "Memorials of the Rev. Joseph Sortain". [ABOVE] A portrait of Reverend Joseph Sortain (1809-1860), an engraving by Henry Edward Dawe (1790-1848) after a painted portrait by James Hardy senior (1801-1879). 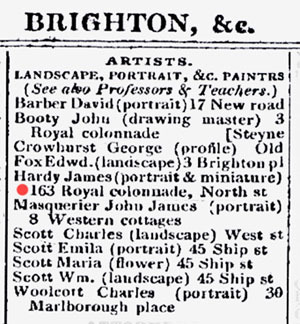 [LEFT] James Hardy listed as a "portrait & miniature" artist at 163 Royal Colonnade, North Street, Brighton, in Pigot & Co.'s Directory of Sussex (1832-1834). [ABOVE] James Hardy listed as a "teacher of drawing" at West Street, Chichester, in Pigot & Co.'s Directory of Sussex (1839). James Hardy was born at Hounslow, Middlesex, in 1801, the son of Jane Chapman and William Hardy. James Hardy originally trained as a musician and in his early twenties he served as "chief trumpeter" to King George IV. By 1824, James Hardy was working as portrait and landscape painter. James Hardy arrived in the Sussex seaside resort of Brighton around 1824. (James Hardy is recorded as a "Profilist" at Grenville Place, Brighton in Baxter's Strangers' Guide of 1824). On 31st August 1825, James Hardy married Elizabeth Vinson (born 1803, Sussex) at St Nicholas' Church, Brighton. A guide entitled "The Watering Places of Great Britain and Fashionable Directory", published in 1831, records "J. Hardy" as an "Artist & Drawing Master" at 143 North Street, Brighton. The following year, Pigot & Co.'s Directory of Sussex, listed James Hardy as a portrait & miniature artist at 163 Royal Colonnade, Brighton. James Hardy worked as a portrait and miniature painter in Brighton between 1825 and 1834. During this time, James Hardy's wife Elizabeth gave birth to 3 children - Henry Hine Hardy (born 1831, Brighton), James Hardy junior (born 1833, Brighton) and Georgiana Hardy (born 1834, Brighton). James Hardy junior was baptised at St Nicholas' Church, Brighton, on 16th January 1833. In adult life, James Hardy junior (1833-1889) worked as a portrait artist in Bath, Bristol and London. By 1836, James Hardy senior had left Brighton and was working in the Sussex town of Lewes. [James Hardy's son Thomas Hardy was christened in Lewes on 26th April 1836]. James Hardy and his family eventually settled in Chichester, West Sussex. James Hardy worked as an artist and drawing teacher in Chichester between 1837 and 1845. James and Elizabeth Hardy's youngest son, Heywood (Haywood) Hardy was born in Chichester on 25th November 1842. Heywood Hardy (1842-1933) later achieved recognition as a portrait artist and animal painter. James Hardy senior worked as a portrait artist in Chichester from 1837 until 1845. 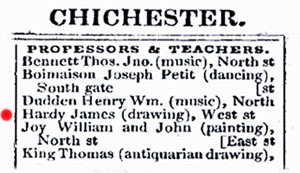 James Hardy is listed as a "Teacher of Drawing" at West Street, Chichester, in the 1839 edition of Pigot & Co.'s Directory of Sussex. 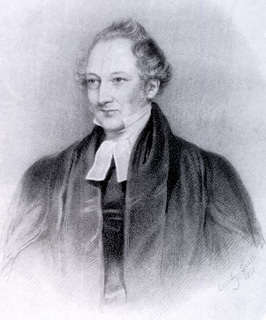 In his later years he (James Hardy senior) developed a religious mania, and lost his patronage by obtruding his views in an irritating manner upon his patrons in private, and upon the public in general, by proclaiming at street corners whenever the opportunity occurred. Stewart and Cutten note that Heywood Hardy, the artist's youngest son, left the family home in Bath at the age of 17 because of the "quarrelsome nature of his father". James Hardy died at Bath, Somerset on 7th January 1879. 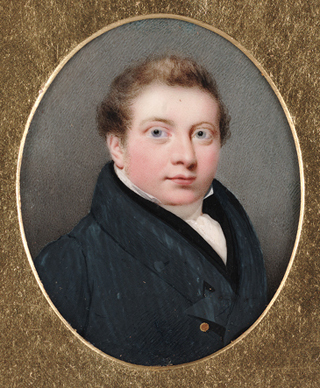 Thomas Harper was active as a portrait artist and miniature painter in Brighton during the 1820s. 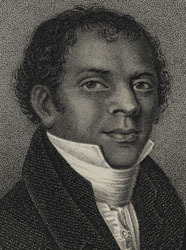 In 1821, Thomas Harper produced a pair of portraits depicting Sake Deen Mahomed (1759-1851), the Shampooing Surgeon of Brighton, and his wife Mrs Jane Mahomed. Baxter's Strangers' Guide to Brighton, published in 1824, Thomas Harper is listed as a "Profilist" at 13c North Street, Brighton. 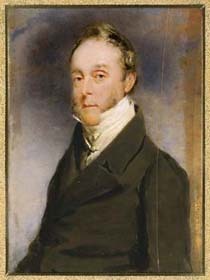 Thomas Harper exhibited his portraits at the Royal Academy between 1817 and 1843. 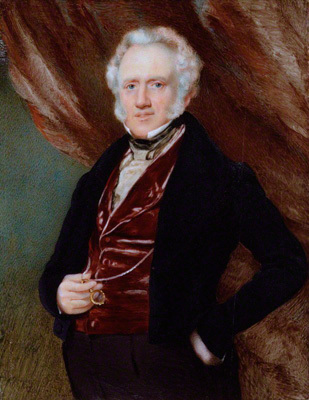 When he exhibited a "Portrait of a Clergyman" at the Royal Academy in 1820, Thomas Harper gave his residential address as 75 Judd Street, Brunswick Square, London. Between 1821 and 1829 Thomas Harper appears to have been based in Brighton. Thomas Harper was particularly known for his portraits of actors and actresses. Between 1825 and 1829, Thomas Harper produced a series of painted portraits entitled "Brighton Beauties" which were later issued as mezzotint prints by Huffam and Thompson. 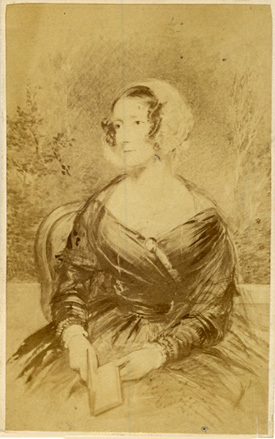 At the 70th Exhibition of Art at the Royal Academy in London in 1838, Thomas Harper exhibited a number of painted miniatures including a portrait of Mrs Perring, a portrait of the Rev. John Howard Marsden, a portrait of Mrs Freeling and a portrait of Mrs Harper, possibly the artist's wife or other relative and portraits of two children. At the time of the 1838 exhibition, Thomas Harper gave his home address as 23 Alexander Square, Brompton. Sake Deen Mahomed was born at Patna in the Indian state of Bihar in 1759. As a young man, Sake Deen Mahomed served as a trainee surgeon in the army of the British East India Company. 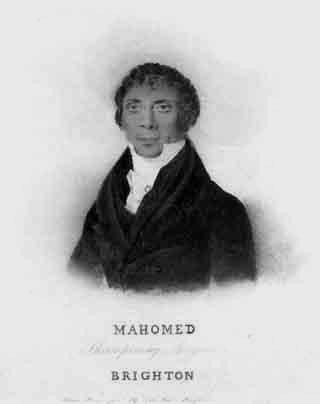 Sake Deen Mahomed travelled to Ireland in 1784, later marrying a local woman named Jane Daly. In 1810, Sake Deen Mahomed opened the Hindoostanee Coffee House in London, but this early type of Indian restaurant failed. Sake Deen Mahomed moved to Brighton in 1814 and found work in a bath house. 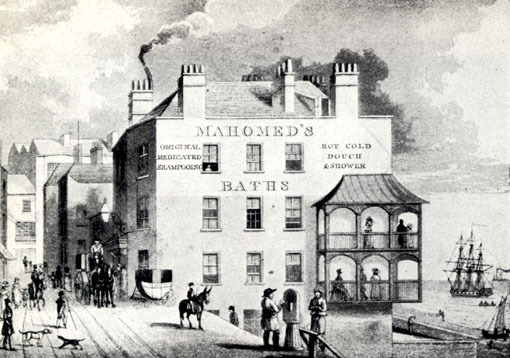 By the end of the following year he had opened his own baths and in 1820 he established Mahomed's Indian Medicated Vapour Baths on Brighton's King's Road. [ABOVE] Mrs. Jane Mahomed (c1780-1850), wife of Sake Deen Mahomed, the famous "Shampooing Surgeon" of Brighton, depicted in a portrait by Thomas Harper (1821). 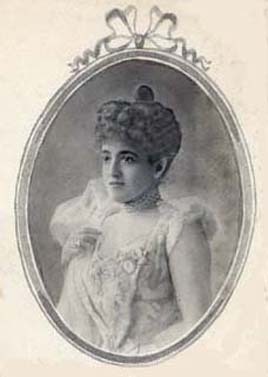 Jane Daly, described as a "pretty Irish girl of respectable parentage" eloped with Sake Deen Mahomed when she was in her teens. 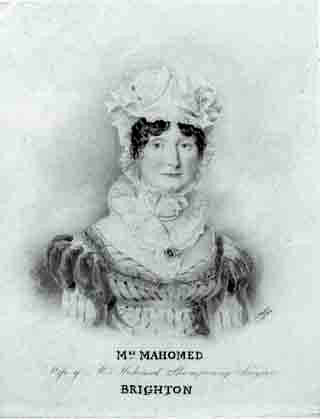 During her long marriage to Sake Deen Mahomed, Mrs Jane Mahomed gave birth to five children - Rosanna, Henry, Horatio, Frederick, and Arthur Mahomed. [ABOVE] Mr. Sake Deen Mahomed (1759-1851), the Shampooing Surgeon of Brighton, depicted in a portrait by Thomas Harper (1821). "Shampooing" was a form of Indian massage involving a medicated vapour bath. Sake Deen Mahomed, who originated from Patna in India, arrived in Brighton in 1814, establishing his Indian Medicated Vapour Baths in King's Road, Brighton in 1820. He described himself as "Shampooing Surgeon" to King George IV. Anton Schell was born in Frankfurt-on-the Main, Germany, around 1832. He was brought to England in 1853 by Alfred Reindel, a German-born "photographic artist" who worked in London. Although described as a "photographic artist", Alfred Reindel was not a photographer, but earned his living by "colouring photographic portraits and other photographic pictures". In an agreement made on 6th September 1853, Alfred Reindel took on twenty-one year old Anton Schell as an assistant "photographic painter" who would be employed to "retouch and perfect all such portraits, pictures and other drawings which the said Albert Reindel shall undertake". As part of the agreement, Alfred Reindel "paid the costs and expenses of the journey of the said Anton Schell to London." A further agreement was made on 29th June 1855, which extended Anton Schell's initial 5 year contract to September 1861 According to a court hearing held in 1858, there was a breach of contract and it seems that Anton Schell left Reindel's employment before 1861. By 1860, Anton Schell and his wife Eva Katharina Wiegel (born c1830, Darmstadt, Germany) were living in Pimlico, London. 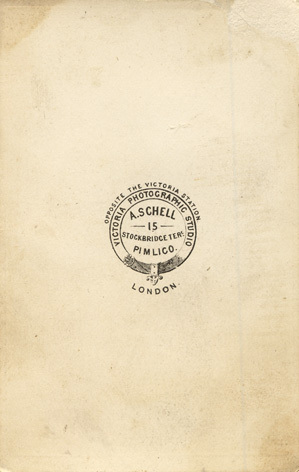 A daughter named Lily Schell was born in Pimlico around 1860 and within a year or so, Anton Schell had established the Victoria Photographic Studio at 15 Stockbridge Terrace, Pimlico, London. By 1867, Anton Schell was working as a photographer and portrait painter in the Sussex seaside resort of Brighton. Local trade directories list Anton Schell as a professional photographer at 17 West Hill Road, Brighton between 1867 and 1870. The 1871 census records Anton Schell, his wife Katherine and their 11 year old daughter Lily residing at 17 West Hill Road, Brighton. On the census return, Anton Schell is described as a "Portrait Painter", aged 39, from Frankfort, Germany. By 1878, Anton Schell and his family had moved to 6 Albert Road, Brighton. Brighton street directories published between 1878 and 1897, record Anton Schell as an artist and portrait painter living at 6 Albert Road, Brighton. Anton Schell's daughter, Lily Schell (born c1860, Pimlico, London), also became an artist. In 1877, Miss Lily Schell exhibited a painting entitled "Roses" at the Brighton Exhibition of Modern Painting. By 1881, Miss Lily Schell was exhibiting her work in London. An exhibition catalogue for the Royal Academy of Arts notes that Miss Lily Schell showed a painting entitled "Jealousy" in 1885. A Royal Academy publication states that at this date Miss Lily Schell was a "Miniature Painter" based at 108 St Stephen's Avenue, Shepherd's Bush, London. Lily's father, Anton Schell exhibited a portrait miniature at the Royal Academy in 1894 from his address at 6 Albert Road, Brighton. When the census was taken on 3rd April 1881, Anton Schell was recorded as a forty-nine year old "Portrait Painter" at 6 Albert Road, Brighton. Residing with Anton Schell at his house in Albert Road was his fifty-one year old wife Katherine and a collection of nieces and nephews.Sharing Anton Schell's home was Josephine Baumann (born c1867, Germany), Francis Edward Buttberg (born 1866, London), Albert Victor Buttberg (born 1870, London) and Lily Kate Buttberg (born 1872, Cambridge). The three Buttberg youngsters were the children of Katherine and Ferdinand Buttberg, a German-born photographer. Francis E. Buttberg was an "Art Student" in 1881, but he later earned his living as a "Professor of Music" in Brighton, Albert V. Buttberg later moved to Scotland where he worked as a "Portrait Artist" and Lily K. Buttberg went on to study Art. There is a suggestion that (Eva) Katharina Wiegel was not Anton Schell's legal wife until 1882. The marriage between Anton Schell and (Eva) Katharina Wiegel was not registered in Brighton until the 1st Quarter of 1882, some twenty-one years after the birth of their daughter, Lily Schell. In 1891, Anton Schell and his wife were still living at 6 Albert Road, Brighton. The 1891 census describes Anton Schell as a 59 year old "Artist-Portrait Painter". Sharing his home in Albert Road were Anton Schell's two nieces, twenty-three year old Alice Buttberg and Lily Kate Buttberg, a 19 year old "Art Student". 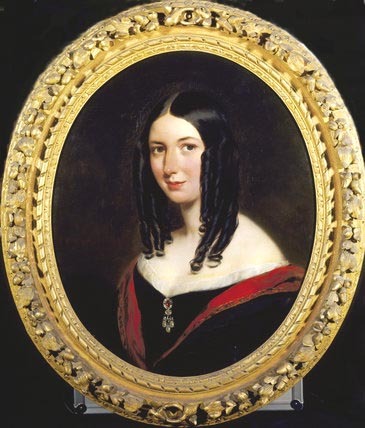 Mrs Eva Katharina Schell, Anton Schell's wife, died in 1897 at the age of 67. Anton Schell died the following year. [ The death of Anton Schell was registered in the Steyning district of Sussex during the 2nd Quarter of 1898 ]. 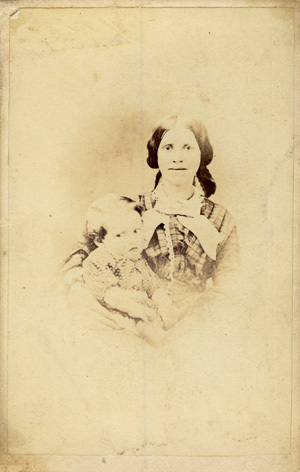 [ABOVE] A carte-de-visite portrait of a mother and child, photographed by Anton Schell at his Pimlico studio around 1861. [ABOVE] The reverse of the carte-de-visite on the left, showing the trade plate of Anton Schell of 15 Stockbridge Terrace, Pimlico, London (c1861). 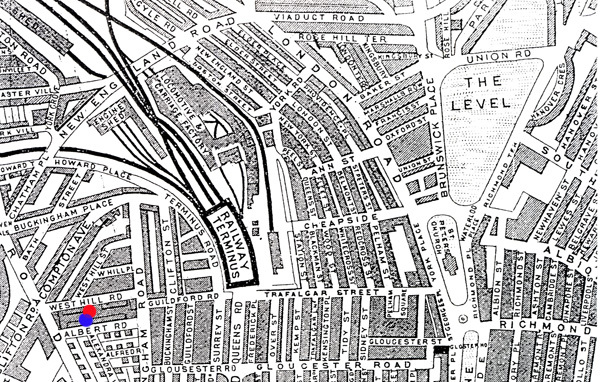 [ABOVE] A late Victorian map showing the streets around Brighton Railway Station and the location of Anton Schell's photographic studios and residences in Brighton. Schell's first studio was situated at 17 West Hill Road, Brighton (marked by a red dot). Around 1878, Anton Schell moved to 6 Albert Road, Brighton (marked by a blue dot). Emily Scott was born in Brighton on 6th January 1798, the daughter of Mary Anne and Edmund Scott (1758-1815), an artist and portrait painter who had settled in Brighton in the 1790s. Emily Scott is recorded as portrait artist at 45 Ship Street, Brighton in Pigot's Directory of Sussex issued for the period 1832-1834. Also recorded at 45 Ship Street, Brighton were Emily's sister, Maria Scott (born 1794), a flower painter, and the landscape artist William Scott. Emily's brother, Charles Scott, is listed as a "landscape painter" in West Street, Brighton. By 1839, Emily Scott was working as an artist at 28 Cannon Place, Brighton. From 1838 until 1855, Miss Emily Scott exhibited her work at The Royal Academy, giving her address variously as 28 Cannon Place (1839) 27 Cannon Place (1843) and 23 Cannon Place, Brighton (1850-1855). Miss Emily Scott painted portraits in watercolour and is described as a "Miniature Painter" in the Royal Academy catalogues. When the 1881 census was taken, Miss Emily Scott was recorded at 31 Russell Square, Brighton. Described as a "Retired Artist", 83 year old Emily Scott is listed as the "Head of Household". Sharing Emily Scott's home was her nephew Edmund Evan Scott (born 1828, Brighton), a 52 year old architect, the son of Charles James Scott (died 1834, Brighton). [ABOVE] A portrait miniature painted by Emily Scott. In the 19th century there were two portrait painters who went under the name of Miss Emily Scott - Miss Emily Scott of Brighton (1798-1883) and Miss Emily Anne Scott (1827-1883). [ABOVE] A lithographed portrait of Rev. 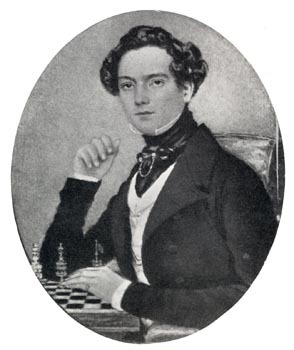 Charles David Maitland (1852), taken from a portrait by Emily Scott of Brighton. Signed "Emily Scott, 1851". Rev. Charles D. Maitland (1785-1865) was the Perpetual Curate of St James's Chapel, St James Street, Brighton. Emily Anne Scott was born in Leicester in 1827, the daughter of the portrait painter William Scott (1797-1862). 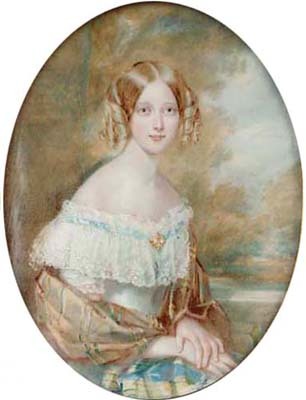 Miss Emily Anne Scott exhibited at The Royal Academy between 1838 and 1853 from the London address of Sussex Cottage, Park Village East, Regent's Park. In 1855, Miss Emily Anne Scott was residing at 12 Norfolk Street, Manchester. 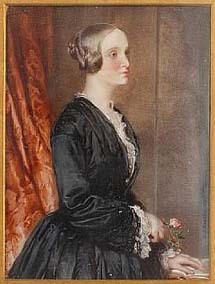 In 1856, Emily Anne Scott married the musician Charles Alexander Scott (c1810-1875) and from that date exhibited miniatures from Chorlton, Manchester, under the name of Mrs Seymour. Edwin Dalton Smith was born in Chelsea in 1800, the son of Charlotte and Anker Smith (1759-1819), an artist and engraver. [Edwin Dalton Smith was baptised at St Ann's Church, Blackfriars, London on 18th November 1800]. Anker Smith and his wife Charlotte had married in 1791 and went on to produce six or more children, a number of whom became artists. Edwin Dalton Smith's siblings included Charlotte Smith (born 1792), Anchor Bowyer Smith (born 1795), Frederick William Smith (1797-1835), a talented sculptor, Clarissa Mary Smith (born 1806) and Herbert Luther Smith (1809-1870), a painter of religious and historical works. Edwin Dalton Smith received his early art training from his father and later studied alongside John Cart Burgess (1798-1863), a portrait painter who had married Edwin's eldest sister, Charlotte Smith. [ In 1816, Edwin Dalton Smith gave his studio address as "at Mr Burgess's, 2 Queen Street, Chelsea"). A precocious talent, Edwin Dalton Smith was exhibiting works at the Royal Academy at the age of 16. At the beginning of his career, Edwin Dalton Smith specialised in painting flowers and fruits. Smith worked for the Royal Gardens at Kew as a botanical artist. At the age of 20, Edwin Dalton Smith was providing illustrations for the Transactions of the Royal Horticultural Society and later he produced watercolour paintings for Robert Sweet's book "The British Flower Garden" (1823-1829). The botanist and horticulturalist Robert Sweet (1783-1835) also commissioned Edwin Dalton Smith to illustrate a number of his other studies, including Flora Australasica (1827-1828). 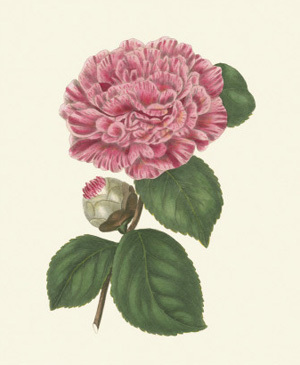 Edwin Dalton Smith also produced the original paintings which appeared as hand-coloured engravings in "The Botanic Garden" by Benjamin Maund (1790-1863). It appears that Edwin Dalton Smith married before his 21st birthday. (Edwin Dalton Smith's bride, Mary, originated from Manchester). The birth of Anker Thomas Smith, the son of Mary and Edwin Dalton Smith was recorded in Chelsea on 7th March 1821. A second son, Frederick Edwin Smith, was born in Chelsea on 11th March 1827. A daughter, Edwina Mary Smith, was born in Chelsea on 5th May 1832. Edwin Dalton Smith's eldest son, Anker Thomas Smith, died at the age of 18 and was buried at St Luke's Church, Chelsea, on 13th August 1839. It appears that Edwin Dalton Smith's second son, Frederick Edwin Smith, also died young, because when Edwin's wife gave birth to another son on 20th November 1834, the child was christened Frederic Edwin Smith, presumably in memory of his deceased child. Another son, recorded as Ross Smith, was born around 1840. From around 1830, Edwin Dalton Smith established himself as a portrait artist and miniature painter. Edwin Dalton Smith exhibited his work in London at the Royal Academy, the Society of British Artists and the New Watercolour Society. By 1841, Edwin Dalton Smith was working as a portrait artist from a studio at No.7 Hertford Street, Mayfair, London. When the 1851 census was taken, Edwin Dalton Smith was residing in Mayfair, London. The census return records Edwin D. Smith and his wife Mary, living in London with their three children - Edwina (aged 18), Frederick (aged 17) and Ross Smith (aged 11). In 1857, Edwin Dalton Smith decided to supplement his income as a portrait painter and miniaturist by establishing a photographic portrait studio at 27a Old Bond Street, London. In the early 1860s, Edwin Dalton Smith was also taking photographic portraits at his old studio at 7 Hertford Street, Park Lane, Mayfair, London. When the census was taken on 7th April 1861, Edwin D. Smith was recorded as an "Artist" at 275 Old Bond Street, Westminster, London. Residing with Edwin Dalton Smith at this time was his wife Mary (born c1800, Manchester) and their grown-up children Ross and Edwina. Although he continued to paint miniatures and small-scale portraits in watercolour, Edwin Dalton Smith concentrated on photographic portraiture during the 1860s and early 1870s. (Edwin Dalton Smith last exhibited a miniature portrait at the Royal Academy in 1866). In 1869, Edwin Dalton Smith moved to Brighton to take over the photographic portrait studio at 69 East Street, Brighton which had been established by the artists and photographers William White and Alfred White eight years previously. When the 1871 census was taken, Edwin Dalton Smith and his family were residing at 11 Rose Hill Terrace, Brighton. On the census return, Edwin D. Smith is described as a 70 year old "Artist - Portrait Painter". Early in 1872, a Brighton newspaper reported the death of Edwin Dalton Smith's wife. The notice, which appeared in March 1872, read: "Death of Mary Smith, aged 72, wife of Edwin D. Smith, artist and photographer, East Street, at their residence, 11 Rose Hill Terrace." After the death of his wife, Edwin Dalton Smith sold his photographic portrait studio at 69 East Street, Brighton to Frederick Oakes Devereux (1840-1912), a photographer and portrait painter. Edwin Dalton Smith appears to have returned to portrait painting. The 1878 edition of Kelly's Directory of Sussex lists Edwin Dalton Smith as a "Portrait Painter" at 10 Grand Parade, Brighton. When the census was taken on 3rd April 1881, Edwin Dalton Smith was recorded living with his unmarried daughter Edwina at 23 Palace Square, Penge, Surrey. Eighty year old Edwin D. Smith gave his occupation as "Miniature Painter". The death of Edwin Dalton Smith was registered in the London district of Islington during the 3rd Quarter of 1883. [ABOVE] Edwin Dalton Smith recorded as an "Artist" and "Portrait Painter" in Brighton in the 1871 census. [ABOVE] A carte-de-visite portrait photographed by Edwin D. Smith at 69 East Street, Brighton (c1870). [RIGHT] A pencilled inscription on the reverse of a carte-de-visite portrait giving the studio address of Edwin Dalton Smith at 69 East Street, Brighton (c1870). [ABOVE] A portrait painting of a woman photographed by Edwin Dalton Smith of 69 East Street, Brighton. 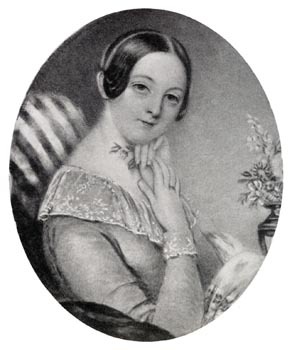 [ABOVE] A miniature portrait of Miss Mary Dickson painted in 1845 by Edwin Dalton Smith. The miniature carries the inscription "Miss Dickson, Painted July 1845, Edwin D.Smith, 7 Hertford St, Mayfair". 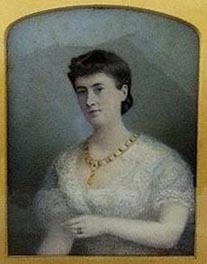 Miss Dickson was a daughter of Mrs Harriet Dickson and Major General William Dickson of Croom Castle, County Limerick. No. 7 Hertford Streer was Edwin Dalton Smith's London studio. [ABOVE] A miniature portrait of George Henry John Heigham (1832-1861) painted around 1852 by Edwin Dalton Smith. At the time of the sitting, George Heigham was a captain of the 7th Dragoon Guards. As a brevet major in the 23rd Royal Welsh Fusiliers, George Heigham served in India. Badly wounded at Lucknow, Brevet Major Heigham died of his wounds on 6th May 1861, aged 30. [ABOVE] A miniature portrait of the writer and traveller James Silk Buckingham ( 1786-1855) painted in 1837 by Edwin Dalton Smith. The miniature has been painted in watercolour and body-colour on ivory. 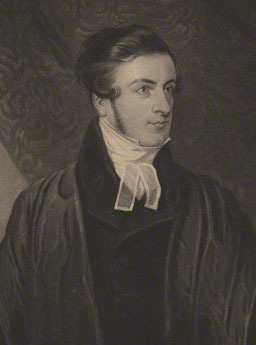 A widely travelled journalist who spent time in the Middle East and India, James Buckingham was elected as the Member of Parliament for Sheffield between 1832 and 1837. Adolphus Henry Augustin Wing was born around 1823 in Marylebone, London, the son of Eliza Mary Cloake and Caleb William Wing (1801-75), a miniature painter and manuscript illuminator who was well known for producing facsimile medieval illustrations. In 1842, when he was only 18 or 19 years of age, Adolphus Wing married Happy Goodchild at St George's Church in Camberwell. The couple went on to produce a dozen or more children, eleven of whom survived infancy - Emma Wing (born c1846), Frank Wing (born 1850), Charles Wing (born c1852), Mary Wing (born c1854), Eleanor Mary Wing (born 1855), Theresa Elizabeth Wing (born 1858), Henry Adolphus Wing (born 1859), William Edward Wing (born 1861), Frances (Fanny) Louisa Wing (born 1862), Thomas Wing (1864) and Walter James Wing (born 1867). In 1845, Adolphus Wing and his wife were living at 6 Hampstead Street, Fitzroy Square, London. 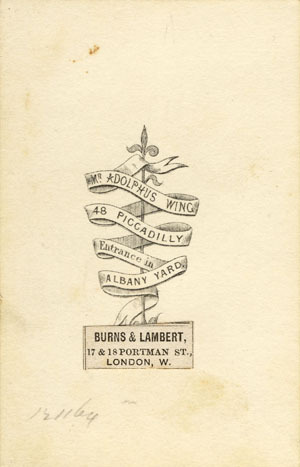 Between 1847 and 1854, Adolphus Wing was living and working in London. In 1848, the year Adolphus Wing exhibited a miniature self portrait at the Royal Academy, he gave his home address as 40 London Street, Fitzroy Square, St Pancras, North London. Between 1855 and 1858, Adolphus and Happy Wing were residing with their children in Wandsworth, Surrey, in South London, although Adolphus Wing did occasionally travel to seaside holiday resorts to offer his services as a portrait artist. For instance, in August 1856, Adolphus Wing was staying in the North Yorkshire resort of Scarborough. Around 1859, Adolphus Wing and his family moved to the Sussex seaside resort of Brighton. [ Adolphus and Happy Wing's son, Henry Adolphus Wing, was born in Brighton during the 4th Quarter of 1859]. Adolphus Wing and his family remained in Brighton for the next 4 years. In the Summer of 1859, Caleb Wing, Adolphus Wing's father, was providing classes in "illuminating manuscripts" at an address in Brighton. At the time of the 1861 census, Adolphus Wing was residing with his growing family at 10 Richmond Terrace, Brighton. On the 1861 census return, Adolphus H. A. Wing is described as a 37 year old "Portrait Artist and Miniature Painter". It was while working as an artist in Brighton that Adolphus Wing fathered at least 3 more children - Henry Adolphus Wing (born 1859), William Edward Wing (born in Brighton during the 1st Quarter of 1861) and Frances Louisa Wing (born in Brighton during the 2nd Quarter of 1862). By 1863, Adolphus Wing was back in London. In March 1863, Adolphus Wing set himself up as portrait photographer in Piccadilly, London. Trade directories record Adolphus Wing as a professional photographer at 9 Albany Courtyard, adjoining No. 48 Piccadilly, Westminster, London. Photography of the highest class. Carte de visite, Vignettes and all other descriptions of portrait by Adolphus Wing, miniature painter, at his commodious and well arranged studio at No 48 Piccadilly, entrance at 9 Albany Court-yard. Copying executed with the greatest care, and invalids attended at their own homes. [ABOVE] Newspaper advertisement giving details of Adolphus Wing's photographic portrait studio at No. 48 Piccadilly, London. It was while Adolphus Wing and his family were residing in Westminster that Mrs Happy Wing, Adolphus's wife, died of typhoid fever and peritonitis at the age of 43. [The death of Mrs Happy Wing was registered in the district of St James, Westminster, during the 4th Quarter of 1867. Towards the end of 1867, Adolphus Wing closed his studio in Piccadilly and opened a new photographic portrait studio in North London at 91 Churchill Road, Kentish Town, St Pancras. When the census was taken on 2nd April 1871, Adolphus Wing was recorded with six of his children at 91 Churchill Road, Kentish Town, St Pancras, London. On the census return, Adolphus Wing, now a 47 year old widower, gives his occupation as "Photographer and Artist". Residing with Adolphus Wing were Eleanor (15), Theresa (13), Harry (11), William (10), Fanny (9) and Thomas (6). By April 1881, when the next census was carried out, Adolphus Wing was living at 11 Quadrant Grove, St Pancras, London. Residing with the 57 year old widower were four of his children - Harry Adolphus Wing, a 21 year old architect, nineteen year old Fanny Louisa Wing, who was working as a cashier for a clothier, Thomas C. Wing, a sixteen year old "Telegraph Clerk" and 14 year old Walter Wing, who was still at school. On the 1881 census return, Adolphus H. A. Wing is described as an "Artist". A decade later, Adolphus Wing was living alone; lodging at 13 Lismore Road, St Pancras, North London. The 1891 census enumerator records Adolphus Wing's occupation as "Artist & Portrait Painter". By the time the census was taken on 31st March 1901, Adolphus Wing was residing in Bournemouth and working as an "Artist & Miniature Painter". Adolphus Wing died in Bournemouth during the 4th Quarter of 1906, aged 84. [ABOVE] A portrait miniature of a young woman painted around 1846 by Adolphus Henry Augustin Wing (c1823-1906). This portrait miniature is painted in watercolour on ivory and measures 2 inches by 1 5/8 inches. [ABOVE] A carte-de-visite portrait of a Catholic priest or cardinal produced by Adolphus Wing (c1823-1906), a photographer and miniature painter based at 48 Piccadilly, London (c1865). [ABOVE] The reverse of the carte-de-visite portrait illustrated on the left showing Adolphus Wing's trade plate. Wing's studio was at 48 Piccadilly, London, but entry was via 9 Albany Courtyard in Albany Yard. 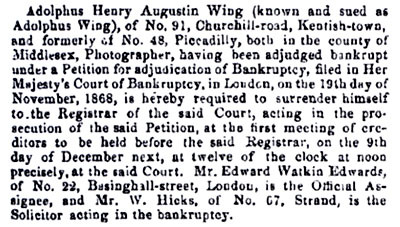 [LEFT] The London photographer Adolphus Henry Augustin Wing declared bankrupt in a notice published in The London Gazette on 24th November 1868. Adolphus Wing's bankruptcy was filed on 19th November 1868 and an Application for Discharge of the Bankruptcy was made on 11th January 1869. Adolphus Wing continued working as a portrait photographer at No. 91 Churchill Road, Kentish Town, St Pancras, North London, until 1871.